American International Industries acquired Nail Tek, a natural nail treatment company, in April 2012. 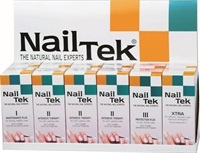 The Nail Tek Nail program was created to help grow and keep nails strong, healthy and natural. Nail Tek formulas are designed to deliver natural results, providing personalized therapy for nails that need strengthening and conditioning. The Nail Tek line consists of nail strengthening treatments and skin care products. Nail Tek brands include Hydration Therapy for moisture balancing, 7 Days to Beautiful Hands, CITRA (the formaldehyde-free line) and Crystal Files designed specifically for natural nails. All Nail Tek products are DBP and Toluene free.